5m retractable metal tape measure. Metric and Imperial measurements. Rubber exterior with wrist strap and metal belt clip. 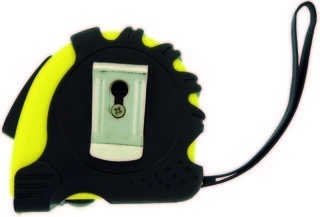 Features 3 different buttons conveniently located to lock the tape measure in place. Four colour process digital decal. Individually packaged in a white box. Variable data printing available allowing you to customise to individuals!